Here's a conundrum. Many commentators have been trying to puzzle out why stocks have been continually hitting new highs at the same time that bond yields have been hitting new lows. See here, here, here, and here. On the surface, equity markets and bond markets seem to be saying two different things about the future. Stronger equities indicate a bright future while rising bond prices (and falling yields) portend a bleak one. Since these two predictions can't both be right, either the bond market or the stock market is terribly wrong. It's the I'm with stupid theory of the bond and equity bull markets. I hope to show in this post that investor stupidity isn't the only way to explain today's concurrent bull market pattern. Improvements in financial market liquidity and declining expectations surrounding the pace of consumer price inflation can both account for why stocks and equities are moving higher together. More on these two factors later. If investors expect strong real growth for the next few decades, a new bond issue has to provide a competitive coupon in order to attract capital. Soon after the bond is issued, economic growth stagnates and the economy's expected real rate of return falls. The bond's coupon, originally rated for a much healthier economy, has become too good for the new slow-growth environment. The price of the bond has to rise relative to its face value (thus counterbalancing the juicy coupon with a guaranteed capital loss) so that its overall rate of return falls to a level commensurate with the economy's lower real rate of return. That's why rising bond prices are often a sign of a bleaker future. As for equities, that same decline in the real rate of return will result in a fall in prices. A stock is a claim on whatever profits remain after interest, and lower real growth means a smaller remainder. No wonder then that a number of investment commentators believe that the modern rise of stock and bond prices requires one set of investors to be acting irrationally; after all, things can't be simultaneously better and worse off in the future. Either that or arbitrage between the two markets is simply impossible, say because large actors like the Fed are rigging the market. Whatever the case, concurrent bull markets implies a giant market inefficiency, as Diego Espinosa has described it. Assume that the real growth rate is constant over time but inflation expectations decline. The real value of all flows of coupon payments from existing bonds are suddenly more valuable, causing a one-time jump in bond prices. If inflation expectations consistently fall over time, then a bull trend in bond prices will emerge. This is standard stuff. And stocks? What many people don't realize is that those same declining inflation expectations will set off a bull market in equities as well. The general view is that a firm's bottom line waxes or wanes at the same pace as inflation, the result being that real stock returns are invariant to inflation. Corporate shares are supposed to be hedges against inflation. This is (almost always) wrong, a point I've made before (here and here). Let me take another stab at it. 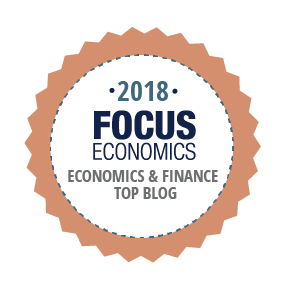 In short, thanks to the interaction between historical cost accounting and the way taxes are collected, rising inflation expectations will boost a firm's real future tax burden, reducing real cash flows and therefore stock prices. Falling expectations about inflation act like a tax cut, increasing real cash flows and stock prices. For folks who want to work through the logic, what follows is a numerical example. Take a very simple firm which incorporates itself, buys inventory and a machine with the cash raised, operates for four years, and dissolves itself. At the end of each year it pays out all the cash it has earned to its shareholders. At the outset, the company buys 40 unfinished widgets for $60 each. Over the course of its life, it expects to process 10 widgets a year and sell the finished product at a real price of $100. In order to process the unfinished widgets, it buys a widget upgrader for $500. The upgrader is used up, or depreciated, at a rate of $125 year so that it will be useless after year four. Since the company will have also depleted its inventory of unfinished widgets by that time, it has nothing left over after the fourth year. The first table shows the anticipated cash flows that will be paid to shareholders after taxes have been rendered to the tax authority, assuming 0% inflation over the course of four years. The cash amounts to an even $876.25 a year. Let's boost the expected inflation rate to 1% (see table below). The real value of cash flows starts out at $876.25 in year one but steadily declines, hitting $866.66 by year four. Shareholder get less real cash flows than they did in a stable inflation environment. On the other hand, if we ratchet down expected inflation to -1%, the real value of cash flows starts out at $876.50 in the first year but climbs to $886.24 by the end of year four. Shareholders enjoy a larger real flow cash payments than they did in either the stable or the rising expected inflation environments. If cash dividends are immediately spent on consumption, this means that shareholders enjoy the greatest flow of consumption when inflation expectations are falling. A reduction in expected inflation will cause a one-time jump in our company's share price. If these reductions in expected inflation occur consistently over time, we get a series of jumps in the company's share price, or a bull market. The core intuition behind this result is that under historical cost accounting, a company's cost of goods sold and its depreciation expenses are both fixed in time. Cost of goods sold is valued on a first-in-first out basis, which means the price of the oldest good is used to value unit costs (in our case, $60), while depreciation is calculated as a fixed percentage of a machine's original purchase price. When inflation is stable, this is unimportant. But once expected inflation rises, the firm's costs grow stale and can no longer keep up with its anticipated revenues, the result being artificially higher pre-tax accounting profits and a larger tax bill. These bloated future tax bills drain cash from the firm, resulting in lower expected cash payouts to shareholders over the life of the firm. When expected inflation falls, the firm's anticipated revenues shrink relative to its costs, the result being lower future pre-tax profits and a lighter tax bill. Less cash filters out of the firm, leaving more cash in the kitty for shareholders to enjoy at the end of each year. What do we know about the actual shape of inflation expectations? In general people have been marking their expectations downwards since the early 1980s, a trend that has been amplified since the credit crisis as central banks around the developed world have consistently undershot their inflation targets. We thus have the underpinnings for a concurrent bull market in stocks and bonds, driven by falling inflation expectations. Let's move on to our second factor. Assuming that the real growth rate and expected inflation both stay constant, we can also generate concurrent bull markets in stocks and bonds by simultaneously improving their liquidity. Innovations in market infrastructure over the years have made it easier to buy and sell financial assets. Investors can increasingly use financial assets as media of exchange, swapping them directly for other financial assets rather than having to go through deposits as an intervening medium. Think buzz words like re-hypothecation and collateral chains. As financial assets become more liquid, a larger portion of their overall return comes in the form of a non-pecuniary liquidity yield. All things staying the same, investors must cough up a larger premium in order to enjoy this liquidity-augmented return, resulting in a one time jump in asset prices. Consistent improvements to liquidity will result in a step-wise asset bull market. I've written here about the ongoing liquidity enhancements in equity markets, and speculated here that thirty-year bull market is bonds is (partly) a function of improved bond liquidity. In the same vein, Frances Coppola once penned an article noting that when everything becomes highly liquid, the yield curve is flat, reducing returns across all classes of financial assets (a flattening of the yield curve implies a jump in the price of long term bonds). While I think that liquidity-improving innovations in market technology and declining inflation expectations can explain a good chunk of the stock bull market, I don't think they can't quite explain as much of the secular rise in bond prices. After all, market interest rates haven't just plunged. In many cases both nominal and real bond interest rates have gone negative. We can salvage this problem by resorting to another liquidity-based explanation for why bond investors are willing to accept negative returns. Government bonds provide a unique range of liquidity services in their role as a financial media of exchange, a role that cannot be replicated by central bank reserves or any other medium of exchange. Reserves, after all, can only be held by banks, and corporate bonds aren't safe enough to serve as universally-accepted collateral. However, governments have gone into austerity mode, reducing the flow rate of bonds coming onto the market. At the same time, central banks are buying up and removing government bonds from circulation. As a result, the supply of unique liquidity services provided by bonds is growing increasingly scarce, forcing investors to bid up the price of these services. Liquidity premia are high. So a negative real return on bonds may be a reflection of the the hidden fee that bond investors are willing to pay to own a government bond's flow of liquidity returns. I've written about this here. In sum, the I'm with stupid theory, with its implication of massive inefficiencies, shouldn't be our only theory for concurrent bull markets. Asset prices move for many reasons, not just changes in expected real growth. Bond and equity investors may be reacting non-stupidly to shifting liquidity patterns and declining inflation expectations, the result being a steady bidding up of the prices of both assets. 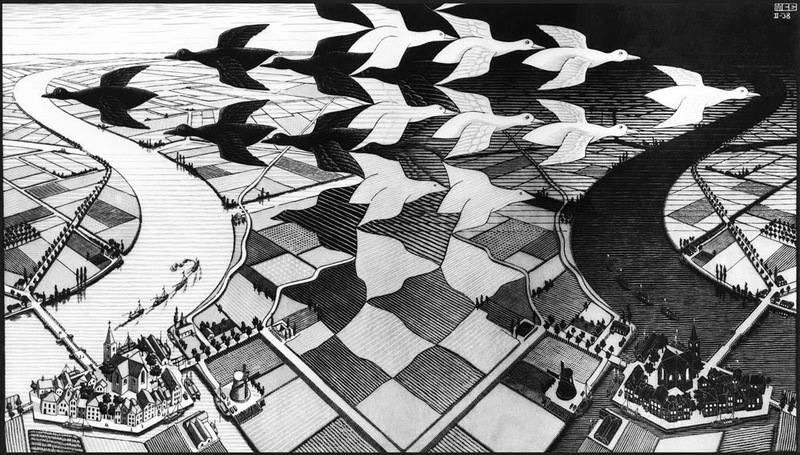 Central bankers are usually classified as either hawks or doves. This post is devoted to a third and rare breed; today's monetary policy canaries. Having taken their respective deposit rates to -0.75%, deeper into negative territory than any other bank in history (save the Swedes), the Swiss National Bank and Denmark's Nationalbank are the canaries of the central banking world, plumbing depths that everyone assumes to be dangerous. Other central bankers, in particular the ECB's Mario Draghi, will no doubt be watching the Swiss and Danes quite closely. The information these two nations generate as they go deep into the bowels of negative rate territory will give a good indication of the level to which the others can safely reduce their own rates before hitting their respective effective lower bounds. That there is an effective lower bound to rates stems from the fact that at some negative nominal interest rate, everyone will choose to convert deposits into cash, preferring to pay storage and handling costs on the underlying paper instrument than enduring a negative interest penalty on the electronic equivalent. Once this process starts, a central bank will be unwilling to push rates much lower given the possibility that the economy's entire deposit base gets converted into paper. Last week Danish central banker Lars Rohde told the WSJ that while there is some lower bound for negative interest rates, "we haven't found it yet." What Rohde was basically saying is that the marginal storage costs of Danish cash are higher than -0.75%, Denmark's current monetary policy rate. If costs were lower, than Denmark's largest and most efficient cash hoarders, Danish banks, would have already rushed to convert their deposits held at the Nationalbank into banknotes—and Rohde would have found his as-yet inactive lower bound. Given his confident tone, Rohde must not be seeing much demand for banknotes. He would know. As his nation's central banker, he's privy to real time information on the quantity of cash that the central bank is being called upon to print up and provide to commercial banks. We can get a rough feel for the data that Rohde is seeing. The chart below shows the year-over-year percent increase in end-of-month Danish cash and coin outstanding. The data is current to the end of February, eighteen days ago. Given that Denmark's deposit rate was initially reduced to -0.5% on January 29 and then to -0.75% on February 5, the data affords us an insight into the first thirty or so days of Danish cash demand at ultra low interest rates. The chart shows that the yearly rate of growth in cash outstanding has accelerated slightly but is well within its normal range. What does this tell us about paper storage costs? Let's crunch some numbers. Danish banks currently have around 350 billion krone in funds on deposit at the Danish Nationalbanken in the form of certificates of deposit. This amounts to about US$50 billion. The central bank's -0.75% interest rate imposes yearly charges of around 2.5 billion krone, or US$375 million, on those deposits. In choosing to hold funds at the central bank, Danish banks are revealing that the cost of handling and storing paper cash must be somewhere above $375 million a year, else they'd have already started to convert into the cheaper alternative. Keep in mind that this illustrates just thirty days with deep negative rates. With cash use in Denmark having been stagnant for a number of years (see chart here), vault space may have been re-purposed for other uses—maybe employees have been parking their commuter bikes in unused vaults or storing old bank documents in them. It could take time for vaults to be cleaned up. If so, a dash into cash could simply be delayed by a few weeks. When Denmark hits its effective lower bound, what will the above chart look like? The 350 billion krone in deposits that banks currently keep at the central bank would quickly be converted into cash. Since Denmark currently has just 65 billion krone in notes and coin in circulation, we'd see a quintupling in cash outstanding. For comparison's sake, this would dwarf previous episodes of strong krone cash demand, like Y2K. And what of our other canary, the SNB? The Swiss, so timely on matters of transport, don't think that up-to-date central banking data is important. The SNB's most recent data on cash outstanding is too stale to give a good idea how the Swiss have reacted so far to -0.75% rates. All we've got is anecdotes. This article reports that a Swiss pension fund attempted to withdraw a portion of its investments from its bank and hold it in a vault, thus saving 25,000 francs per 10 million francs after storage & handling costs, the implication being that these costs run around 0.5% a year. We'll have to wait for more data to come out of Switzerland before we can gauge whether it is at its effective lower bound. What we do know is that Switzerland's bound will be much tighter than Denmark's. That's because while Denmark's largest denomination note is the 1000 krone note (worth about US$141), Switzerland's largest note is the 1000 franc note (worth about US$993.) That makes a US$1 million bundle of Danish notes seven times more bulky than that same bundle of Swiss notes, resulting in higher storage costs. This has important implications, since Mario Draghi's ECB, which issues a 500 euro note (worth US$530), likely has an effective lower bound that lies somewhere in between these two. All of these data points may seem quite being arcane, but they have a very real policy significance. They're the difference between a central bank running out of interest rate ammunition, or buying itself an extra ten 10 basis point rate cuts. The final chapter in the Zimbabwe dollar saga? Here's an interesting fact. Remember all those worthless Zimbabwe paper banknotes? The Reserve Bank of Zimbabwe (RBZ), Zimbabwe's central bank, is officially buying them back for cancellation. According to its recent monetary policy statement, the RBZ will be demonetizing old banknotes at the "United Nations rate," that is, at a rate of Z$35 quadrillion to US$1. Stranded Zimbabwe dollar-denominated bank deposits will also be repurchased. As a reminder, Zimbabwe endured a hyperinflation that met its demise in late 2008 when Zimbabweans spontaneously stopped using the Zimbabwe dollar as either a unit of account or medium of exchange, U.S. dollars and South African rand being substituted in their place. Along the way, the RBZ was used by corrupt authorities to subsidize all sorts of crazy schemes, including farm mechanization programs and tourism development facilities. Upon hearing about the RBZ's buyback, entrepreneurial readers may be thinking about an arbitrage. Buy up Zimbabwe bank notes and fly them back to Zimbabwe for redemption at the RBZ's new official rate, making a quick buck in the process. But don't get too excited. The highest denomination note ever printed by the RBZ is the $100 trillion note. At the RBZ's demonetization rate, one $100 trillion will get you... US$0.003. With these notes selling for US$10 to $20 as collectors items on eBay, forget it—there's no money to be made on this trade. If you've already got a few $100 trillion Zimbabwean notes sitting in your cupboard, you're way better off hoarding them than submitting them to the RBZ's buyback campaign. But this does give us some interesting data points about the nature of money. Last year I wrote two posts on the topic of whether money constituted an IOU or not. With the gold standard days long gone, central banks no longer offer immediate redemption into some underlying asset. But do they offer ultimate redemption into an asset? A number of central banks—including the Bank of Canada and the Federal Reserve—make an explicit promise that notes constitute a first claim or paramount lien on the assets of the central bank. This language implies that banknotes are like any other security, say a bond or equity, since each provides their owner with eventual access to firm assets upon liquidation or windup of the firm. George Selgin is skeptical of the banknotes-as-security theory, replying that a note's guarantee of a first claim on assets is a mere relic of the gold standard. However, the Bank of Canada was formed after Canada had ceased gold convertibility. Furthermore, modern legislation governing central banks like the 2004 Central Bank of Iraq (CBI) Law declares that banknotes "shall be a first charge on the assets of the CBI." [See pdf]. So these promises certainly aren't relics of a bygone age. The Zimbabwean example provides even more evidence that a banknote constitutes a terminal IOU of sorts. After all, Zimbabwean authorities could have left legacy Zimbabwe dollar banknotes to flap in the wind. But for some reason, they've decided to provide an offer to buy them back, even if it is just a stink bid. Given that banknotes are a type of security or IOU, how far can we take this idea? For instance, analysts often value a non-dividend paying stock by calculating how much a firm's assets will be worth upon break up. Likewise, we might say that the value of Zimbabwean banknotes, or any other banknote, is valued relative to the central bank's liquidation value, or the quantity of central bank assets upon which those notes are claim when they are finally canceled. If so, then the precise quantity of assets that back a currency are very important, since any impairment of assets will cause inflation. This is a pure form of the backing theory of money. I'm not quite willing to take this idea that far. While banknotes do appear to constitute a first claim on a central bank's assets, the central bank documents that I'm familiar with give no indication of the nominal quantity of central bank assets to which a banknote is entitled come liquidation. So while it is realistic to say that the Reserve Bank of Zimbabwe always had a terminal offer to buy back Zimbabwe dollars, even during the awful hyper-inflationary period of 2007 and 2008, the lack of a set nominal offer price meant that the value of that promise would have been very difficult to calculate. More explicitly, on September 30, 2007, no Zimbabwean could have possibly know that, when all was said and done, their $100 trillion Zimbabwe note would be redeemable for only US$0.003. The difficulty of calculating this terminal value is an idea I outlined here, via an earlier Mike Friemuth blog post. While the final chapter of the Zimbabwe dollar saga is over, the first chapter of Zimbabwe's U.S. dollar standard has just begun. Gone are the days of 79,600,000,000% hyperinflation. Instead, Zimbabweans are experiencing something entirely new, deflation. Consumer prices have fallen by 1.3% year-over-year, one of the deepest deflation rates in the world and the most in Africa. With prices being set in terms of the U.S. dollar unit of account, Zimbabwean monetary policy is effectively held hostage to the U.S. Federal Reserve's 12 member Federal Open Market Committee. Most analysts expect the Fed to start hiking rates this year, so I have troubles seeing how Zimbabwean prices will pull out of their deflationary trend. Few people have experienced as many monetary outliers as the citizens of Zimbabwe over such a short period of time. I wish them the best. Paul Krugman has two posts discussing the effective lower bound to interest rates. The first I agree with, albeit with a caveat, and the other I don't. In his first post Krugman takes Evan Soltas to task for including not only storage costs in his calculation of the effective lower bound, but also the extra convenience yield provided by deposits. Krugman's point is that once people are "saturated" with liquidity, as they seem to be now, then forgoing the liquidity of a short term marketable debt instrument (like a deposit) costs them nothing. If so, then the lower bound to nominal interest rates is solely a function of storage costs. If it costs 0.50%/year to store and handle Swiss paper currency, then the rate on a Nestle bond can't fall below -0.50%. If it trades at -0.55%, an arbitrageur will contract to borrow the bond until it matures on May 29, sell it now, and convert the proceeds into 0% yielding SFr 1000 banknotes (these notes eventually being used to repay the bond lender). Our arbitrageur will incur 0.50%/year in storage costs while getting 0.55%/year from the bond lender, earning a risk-free return of 0.05%. 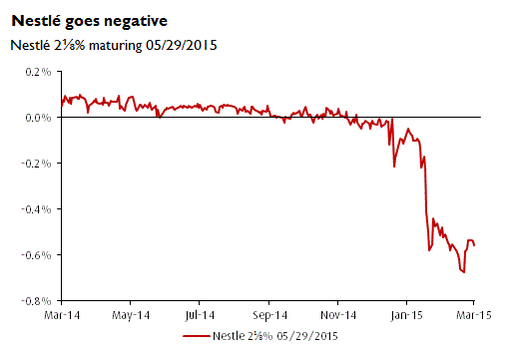 Competition among arbitrageurs to harvest these gains will prevent Nestle's bond yield from falling much below storage costs. However, here's the caveat. Krugman is assuming that liquidity is a homogeneous good. It could very well be that "different goods are differently liquid," as Steve Roth once eloquently said. The idea here is that the sort of conveniences provided by central bank reserves are different from the those provided by other liquid fixed income products like deposits, notes, and Nestle bonds. If so, then investors can be saturated with the sort of liquidity services provided by reserves (as they are now), but not saturated by the particular liquidity services provided by Nestle bonds and other fixed income products. Assuming that Nestle bonds are differently liquid than central bank francs, say because they play a special roll as collateral , then Soltas isn't out of line. Once investors have reached the saturation point in terms of central bank deposits, the effective lower bound to the Nestle bond isn't just a function of the cost of storing Swiss paper money, but also its unique conveniences. This changes the arbitrage calculus. Our arbitrageur will now have to pay a fee to the lender of the Nestle bonds in order to compensate them for services forgone. Let's say the cost of borrowing the bond is 0.25%/year. Shorting the bond once it hits -0.55%, paying the borrowing cost of 0.25%, and storing the proceeds at a cost of 0.50% a year results in a loss of 0.20%. With the arbitrage being unprofitable, the Nestle bond can theoretically fall further than in our previous example before it hits the effective lower bound (specifically, its lower bound is now -0.75%). ...one might suppose that Treasuries supply a convenience yield of a different sort than is provided by bank reserves, so that the fact that the liquidity premium for bank reserves has fallen to zero would not necessarily imply that there could not still be a positive safety premium for Treasuries. Unfortunately, it's almost impossible to know for sure whether the liquidity services of a Nestle bond, or any other bond for that matter, are valued on the margin when people are already saturated in reserves. This is because there is no market for liquidity. If there was, then we could back out the specific price that investors are currently placing on a given bond's liquidity services, say by asking them to put a value on how much they need to be compensated if they are to forgo those services for a period of time. I've mentioned liquidity markets in many different posts. But I digress. Krugman ends his first post saying that "I am pinching myself at the realization that this seemingly whimsical and arcane discussion is turning out to have real policy significance." But in his second post he backtracks, saying that a "minus x lower bound" isn't all that special in term of policy, implying that x (i.e. storage cost) is low and likely to diminish thanks to financial innovation. Here I disagree. Once a central bank has reduced rates to the point at which it is facing a run into paper storage, it can turn to a new tool to buy itself even more room to the downside for rate cuts: the manipulation of x, or the storage costs of cash. To conclude, we've all found out by now that there isn't a zero lower bound. Instead it's a minus x lower bound. The next step is to realize that x isn't set in stone, it can itself be made into a tool of monetary policy. If you've been reading Bill Gross's last few letters, you'll know that he's been a bit grumpy of late. It's that dang new trend that has hit bond markets, negative interest rates. Gross has been using words like incredible, surreal, and inconceivable to describe their arrival.Negative nominal bond rates certainly seem odd. Just look at the chart below, which illustrates what could very well be the two lowest-yielding bonds in the world, maybe all of history: the 3.75% Swiss government maturing in July 10, 2015 and the 4% Danish government bond maturing November 15, 2015. But is the idea of a negative rates really so strange? Gross blames negative rates on central bankers who "continue to go too far in their misguided efforts to support future economic growth," in doing so "distorting" capitalism's rules. He's not alone; plenty of people claim that without autocratic price fixers like the SNB's Tommy Jordan and the Danmarks Nationalbank's Lars Rohde, rates would rapidly to rise to a more natural level like 1% or 2%. Not necessarily. Even an economy without meddling central banks could be characterized by negative nominal rates from time to time, or, stealing from Tony Yates; "a negative rate doesn't distort capitalism, it IS capitalism." Each state has its own advantages and disadvantages. If we hold the gold dust in our pockets, we'll have instant access to a highly-liquid medium of exchange. Unlike illiquid media of exchange, liquid media provide us with the means to rapidly re-orient ourselves come unexpected events. With gold dust on hand we can purchase the necessities that allow us to cope with sudden problems or to take advantage of lucky breaks. At the end of the day, we may never actually use our gold to purchase things, preferring to keep it horded under our mattress. Even so, it hasn't sat their idly, but has provided us with a stream of consumption over time. The discounted stream of comfort that liquidity provides represents the total expected return on gold dust-held. If we choose the second state and lend out our gold dust, we lose access to this liquidity and thus forfeit the expected stream of comfort that gold dust provides. Because we need to be compensated for this loss, a borrower will typically pay the lender a fee, or interest. But gold dust is burdensome. It is heavy and must be arduously weighed out and stored overnight in expensive vaults. IOUs, on the other hand, are a breeze to store. By offering to take our gold dust off our hands for a year or two, a borrower agrees to unburden us of storage expenses while providing us with a feather-light IOU in return. So on the margin, when choosing between gold dust and an IOU, we are comparing the low storage costs of the illiquid IOU against the extra liquidity of cumbersome gold dust. Say that the costs of storing and handling gold dust grow substantially. At some much higher carrying cost, rather than requiring a fee from a borrower (i.e. positive interest) a lender will willingly pay the borrower a fee (i.e. will accept a negative interest rate) for the benefit of being temporarily unburdened of their gold dust. The loss of liquidity that the loan of gold dust imposes on the lender is entirely overwhelmed by the benefits of being freed from onerous storage costs. We get a sub-zero interest rate. The second way to arrive at sub-zero interest rates is to narrow the vast gap between the respective liquidity returns on gold dust and IOUs. There are a few ways to go about this. Imagine that retailers who had previously only accepted gold dust as payment begin accepting IOUs too. Simultaneously, borrowers innovate by printing their paper IOUs in round numbers, making them far easier to count than grams of dust. All of this narrows the liquidity gap by improving the liquidity of IOUs. If the liquidity of IOUs improves so much that it exceeds the liquidity of the gold dust, an IOU effectively provides a greater stream of relief-providing services than gold. When this happens, lenders will clamour to pay a fee in order to lend their gold dust, since the superior optionality that an IOU provides is valuable to them. This fee represents a sub-zero interest rate. Another way to narrow the vast liquidity gap between gold dust and IOUs is to create so much liquidity that, on the margin, liquidity becomes like air; it has no value. Neither gold dust nor IOUs can offer a superior liquidity return if society no longer puts any price on liquidity. In this situation, the interest rate on IOUs is purely a function of storage costs. Since an IOU will typically be less costly to store than the dust, the borrower of gold will typically receive a fee from the lender, a negative interest rate, in order to cover storage costs. Paul Krugman takes this tack here to explain negative rates. So in the end, we can get negative nominal interest rates without central bankers. How far below zero can interest rates fall in a gold dust world? At least as low as the cost of storing gold dust and the degree to which the marginal value of an IOUs liquidity exceeds that of gold dust. Obviously we don't actually use gold dust in the real world, but the same principles apply to a cash-using economy. The theory behind negative rates isn't so surreal after all, Mr. Gross.